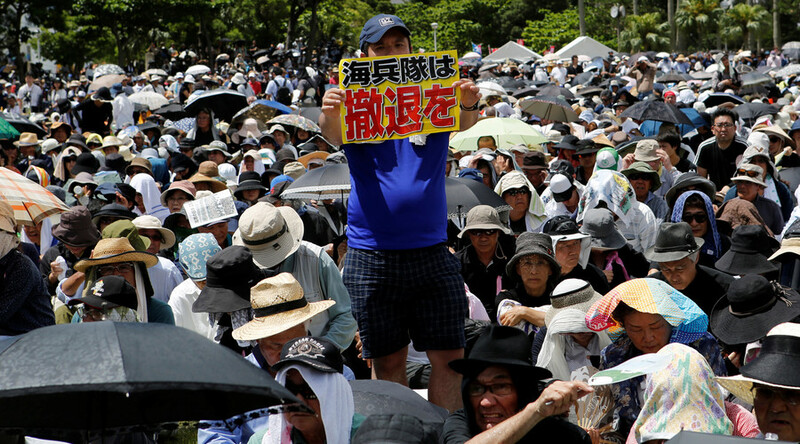 Activists opposing the US military presence on the Japanese island of Okinawa are protesting the ongoing detention of one anti-US base activist over a series of minor offenses. Hiroji Yamashiro, 64, had been leading protests against the construction of a new US marine corps installation, before he was arrested on October 17 last year. The island already boasts 32 such facilities. Yamashiro and his supporters have claimed he is being detained for politically-motivated reasons and that the Japanese government is trying to silence him. He is being held on suspicion of cutting a wire fence around a Marine Corps helipad construction site, interfering with a public officer's duties, causing bodily harm, and of obstructing the construction of a Marine Corps air station. US forces have been stationed on Okinawa since the end of WW2, and the base has long been a contentious issue in Japan. This latest series of protests are against the construction of new bases in Henoko and Takae, which locals say will damage the ecosystem. Under Japanese law, suspects can be held for a period of 23 days before they must be charged or released. Yamashiro has been held for three times that period and has also reportedly been prevented from seeing his family throughout his detention. Yamashiro’s supporters have submitted a petition calling for his release to Naha district court. It has reportedly been signed by 40,000 people and there have been a number of protests outside the building. A number of public figures including documentary writer Satoshi Kamata, author Keiko Ochiai, and commentator Makoto Sataka have also called for his release.